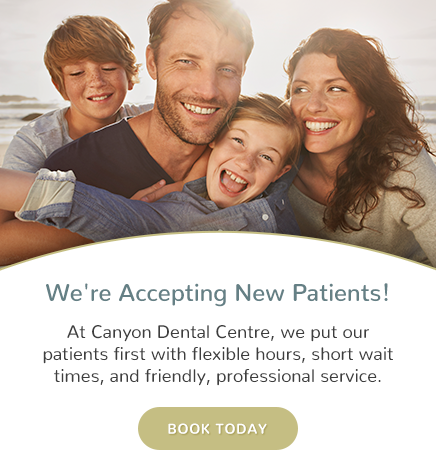 Canyon Dental Centre in North Vancouver provides veneers and bonding for patients looking to change the appearance of their smile. Veneers are a thin layer of porcelain that is bonded to the surface of the tooth to improve its esthetics or to protect a damaged tooth. Veneers or porcelain laminates are like acrylic or gel fingernails and can be used to close spaces, mask stains and discolouring, cover chipping, correct misshapen or crooked teeth. Stained teeth – badly stained teeth that cannot be improved by teeth whitening or other treatments. Damaged teeth – teeth that have become badly worn through excessive grinding or by carbonated drinks, as well as those that have been chipped or broken. Crooked teeth – for teeth that are not severely crooked, veneers can be placed to make them look straighter. Bonding can be used for smaller cosmetic corrections than veneers. It consists of a resin that is applied to your teeth and is generally the same colour as your natural teeth. During the bonding procedure, a resin is applied to your teeth using a high-intensity light. Once the resin is applied, the bonded resin is sculpted to your teeth and polished. What can bonding be used to fix?